Girafarig from SM Lost Thunder has an attack which seriously disrupt your opponent’s strategy as well as an ingredient essential for fulfilling an alternate win condition. It has two attacks, but one that’s worth mentioning at all is Get Lost. This attack does live up to its command/name, as it sends two cards from your opponent’s discard pile into the Lost Zone, rendering it outside of the match. You can pretty much pick anything. Getting rid of Pokémon means that your opponent can’t get them back (even more frustrating if one of the evolving stages gets lost), but suddenly fuels up Lost March if you’re not careful. In regards to Trainer cards, it is also helpful to remove critical pieces, and even help you win the game if you can get 12 Supporters in the Lost Zone due to Unown Missing. And finally, getting rid of energy can hinder some attackers, unless you run into the rare Raikou that boosts damage output if even a single Lightning energy is in the Lost Zone. Overall, the power to remove cards from the match is offset by giving up an attack just to use Get Lost. I can see Girafarig being in its own deck for disruptive purposes. Girafarig (LOT 94) gallops into the Pokemon TCG from the Lost Thunder expansion set. This 90 HP Basic Psychic Pokemon has two attacks, only one of which is worth discussing. Get Lost, for a single Colorless energy, allows you to select two cards from your opponent’s discard pile and move them to the Lost Zone. This card has the potential to significantly disrupt, if not singlehandedly beat, archetypes in the format today that rely on recycling energy from the discard pile. Most notably, Alolan Exeggutor (FLI 2), Blacephalon GX (LOT 52), Malamar (FLI 51), among others, might have trouble winning against Get Lost. If you could get enough of your opponent’s energy cards into the Lost Zone, they might not be able to attack later in the game. This sort of disruption is why some players are bringing a copy of it into their sixty cards. Not many, however, have taken the bait on this card. None of the top eight decks from Roanoke played it, and it was only in two of the top finishing lists from Brazil. Sending two cards to the Lost Zone just isn’t enough. Exeggutor runs a wide array of different types of energy, not just five, and Blacephalon will blast you into oblivion before you get to use Get Lost more than once. Malamar can potentially just recycle other energy cards (I frequently have extra energy in my discard at the end of the game when I play Malamar archetypes) and you’re going to be weak to it as well. It’s an interesting idea, and one that is not without any merit, but it just doesn’t do enough to stop your opponent by itself. Maybe if you can Guzma stall an incapacitated Pokemon in the active position for a couple of turns, maybe then you can effectively pull off Get Lost, but most of the time this card won’t even hit the bench unless you start it in your active position… which would be disastrous. I do like Girafarig, however, but only because it reminds me of a stuffed animal we got for my son when he was very young. We thought it was a horse at first, but then realized it was a giraffe, so we called him Jerry the Griaffahorse. He wound up being an archeologist, which is similar to what Girafarig does, except I guess he would dig things up from “Lost Zones” instead of putting them in there. Note: My review for yesterday did go up, but about an hour late due to a misunderstanding. Sorry for the inconvenience! This next card did not make any of our personal top picks list but it showed up in the 5th place Buzzwole-GX/Lycanroc-GX (SM – Guardians Rising 74/145, 138/145, 156/145) deck and 17th place Zoroark Control deck at the Sao Paulo International Championship, as well as the 17th and 52nd place Steelix (SM – Celestial Storm 89/168) Stall decks and a 60th place Shuckle-GX Stall deck at the Roanoke, VA Regional Championship. That card is Girafarig (SM – Lost Thunder 94/214), a Basic [P] Type Pokémon with 90 HP, [P] Weakness, no Resistance, Retreat Cost [C], and two attacks. The first attack is “Get Lost” for [C], which has you select two cards from your opponent’s discard pile and send them to the Lost Zone. The second is “Mind Shock” for [CCC], which does 70 damage while ignoring Weakness or Resistance. At a glance, the only thing that [b]really[/b] stands out is Get Lost… and that is indeed why you’d run this card. Not that being a Basic isn’t vital; a Stage 1 (let alone a Stage 2) would be too slow and resource intensive. Girafarig lets you mess up strategies that rely on cards in your opponent’s discard pile… including cards that your opponent plans on recycling. Most decks run at least one of Rescue Stretcher, Energy Recycle System, and/or Pal Pad to recycle some key cards from the discard pile, after all. In fact, very few competitive, contemporary decks lack an additional risk. I’d say the only ones with barely any added vulnerability are Garbodor (SM – Guardians Rising 51/145, 51a/145) decks, Buzzwole decks, Buzzwole-GX decks, Spread Decks, and Lost March. Granbull (SM – Lost Thunder 138/214) is a metaphorical coin toss; the deck constantly discards its own hand, which usually means something it hopes to eventually recycle is in its discard pile. Zoroark-GX decks? All variants count on “safe” to discard fodder for its “Trade” Ability, and some – like Zoroark Control – run Oranguru (SM – Ultra Prism 114/156) to recycle the control elements over and over again. Wall Stall decks, like the one built around Shuckle-GX, Steelix (SM – Celestial Storm 89/168), etc. are inclined to eventually bring out an Oranguru or maybe loop copies of Lusamine to cripple your offense until you deck out (Oranguru usually only showing up after your offense is totally crippled); can’t recycle what isn’t there. Malamar (SM – Forbidden Light 51/131; SM – Black Star Promos SM117) and Naganadel (Blacephalon-GX or otherwise) decks are in a similar situation; it is unlikely you can remove enough basic Energy cards from the discard pile to cripple the deck, at least with a single clutch Girafarig. Where removing just two basic Energy can seriously injure a strategy are Alolan Exeggutor (SM – Forbidden Light 2/131) variants; two basic Energy cards of different Types sent to the Lost Zone is -40 to its damage output, and I see few Alolan Exeggutor decks running “spare” copies of its off-Type Energy to thwart this approach. Vikavolt decks are a little more vulnerable than the baseline, but not by much, even for the Rayquaza-GX builds. Stuff will hit the discard pile, cards which it needs to recycle, but it either recycles them quickly or have enough spares that a single Get Lost won’t shut the deck down. Gardevoir-GX is in a similar boat, except it is more that its GX-attack might whiff on something you were really counting on recycling. Sylveon-GX decks sometimes are backed by Gardevoir-GX, and other times are run on their own with a heavier control focus and recycling tricks; again, these create a heightened risk. I haven’t seen a serious Magezone (SM – Ultra Prism 83/156) deck in a while, and I’m not sure if I’ve seen a serious Magnezone (SM – Forbidden Light 36/131) deck at all, but decks that rely on attaching multiple Energy cards from hand tend to rely on large-scale Energy recycling cards like Fisherman to help get it back once it hits the discard pile. Passimian (Sun & Moon 73/149; SM – Black Star Promos SM12) and Passimian (SM – Ultra Prism 70/156) decks count on being able to recycle a Passimian after it KO’d; this is less vulnerable than it sounds because of how quickly and regularly a Passimian is recycled, but whiff once and Get Lost all but cripples this deck. Though it hasn’t resulted in much success, Girafarig is pretty important to Unown (SM – Lost Thunder 92/214), the one with the “MISSING” Ability that lets you win the game if it is Active and your opponent has 12 or more Supporters in the Lost Zone. We should also discuss this in the Expanded Format where it may actually be better! Yeah, most of the decks I mentioned above weren’t big deals in Expanded, but more general tactics fear Get Lost. This is the format that still has Battle Compressor and VS Seeker. It still has Special Charge. It still has Exeggcute (BW – Plasma Freeze 4/116; BW – Plasma Blast 102/101). When you do get to more deck-specific examples, there are the likes of Sableye (Dark Explorers 62/108) and Night March. You also gain access to tricks like Level Ball and Dimension Valley. As for the Limited Format, Giarafarig is a solid pull, but this time as a Basic beatstick. Your opponent may have some cards they can recycle, but most of the time they won’t. Instead, just doing 70-for-three of any Energy and having 90 HP is “good enough”. 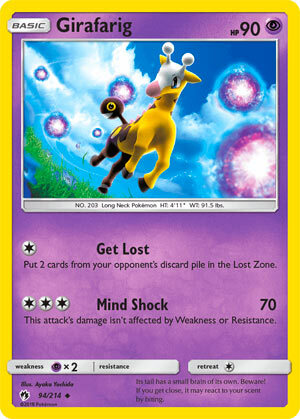 Girafarig is a great example of TecH due to its Get Lost attack; it isn’t usually worth giving up an easy Prize and making your deck less stable with a single for its general usage. When you get to certain key matchups, however, it can really mess up an opponent’s strategy. If Mind Shock had been a true vanilla attack with even its slightly subpar damage return, it would have made this card even better; several of the decks I stated aren’t overly worried about Get Lost would have feared 70-for-[CCC] that applied Weakness… but Mind Shock doesn’t apply Weakness, so the likes of Buzzwole, Buzzwole-GX, and Garbodor have nothing to fear.